Sammy Svitana looks to pin his opponent. Sammy Svitana locks up with an opponent. 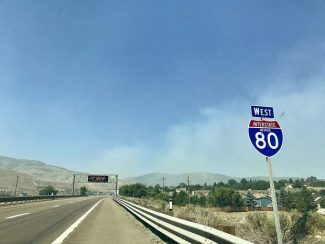 Hank McDaniel works for the fall. Sammy Svitana locks up an opponent. Quinn Dorst gets his hand raised following a match at the Nevada State Championships. Hank McDaniel competes at the Nevada State Championships. Lucas Scapini wrestles at the Nevada State Championships. Sammy Svitana takes an opponent to the mat. 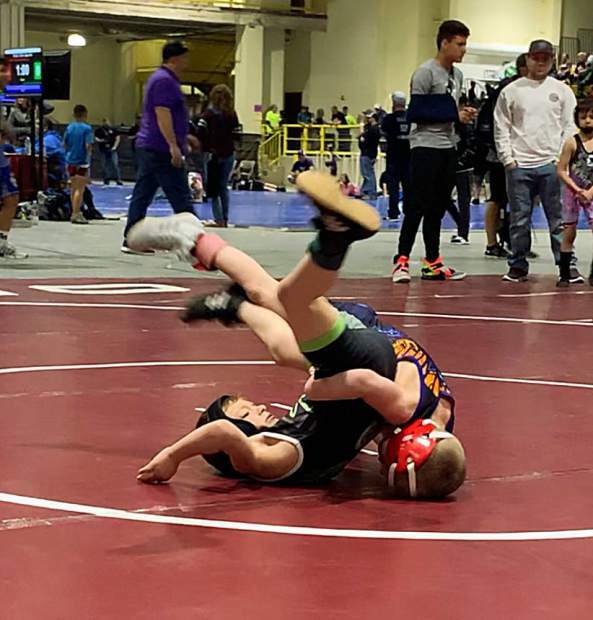 A handful of Truckee wrestlers traveled to Winnemucca last month to compete against Nevada’s top grapplers in the final meet of the season. 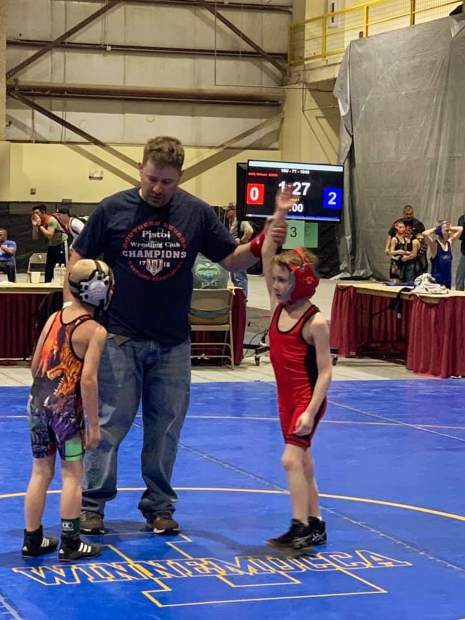 The three-day USA Wrestling Nevada State Championships began on Friday, March 22, and featured more than 250 of the state’s best young wrestlers. 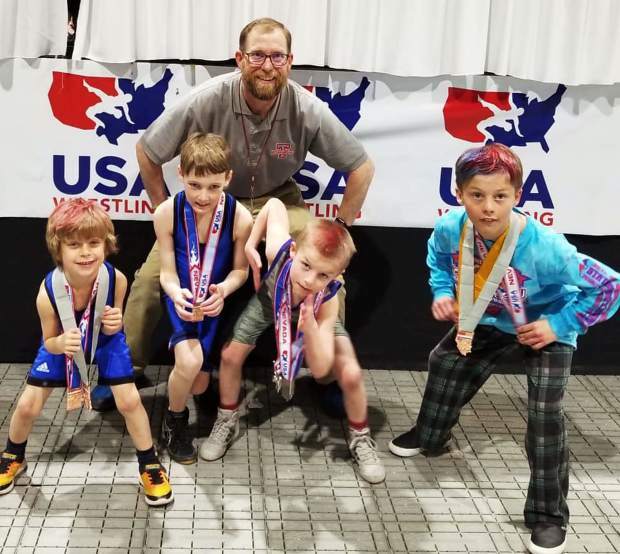 The Truckee Wrestling team, which serves as the area’s youth program, brought six youngsters to the meet and came home with several podium finishes. 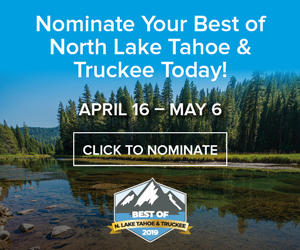 Truckee’s Sammy Svitana led the way with a trio of runner-up finishes in each of the three disciplines — folkstyle, freestyle, and Greco-Roman. 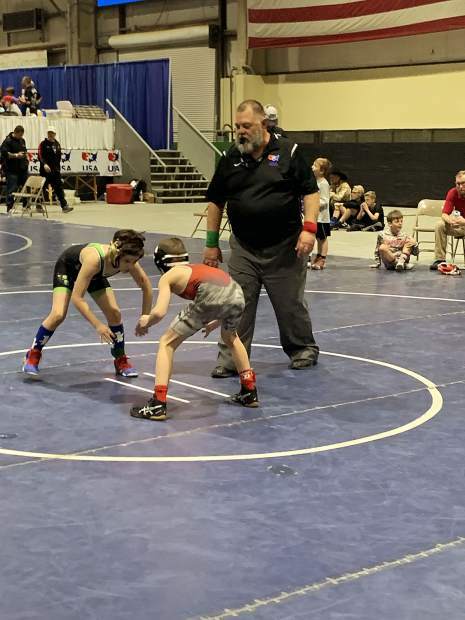 Svitana came into the Folkstyle 8U 49-pound tournament with a record of 55-1, and dispatched his first two opponents, winning via a 9-2 decision before pinning his next opponent to advance into the semifinals. Svitana and Las Vegas wrestler Israel Roybal battled to a sudden victory overtime period during the semifinal match, which Roybal won, before going on to capture the 49-pound championship. Svitana then challenged the wrestler Roybal defeated in the finals, and won via fall in the first round to claim second place. 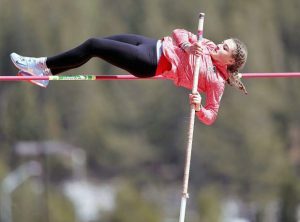 Svitana then returned to the mats the following day for the freestyle tournament. After winning by fall in the semifinals, Svitana again locked horns with Roybal, who took the win for his second state title of the meet. 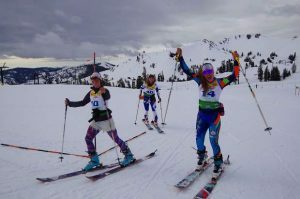 Svitana finished as runner-up. Svitana would suffer a loss in the semifinals to next day during the Greco-Roman tournament, but stormed back with a quick pin in his next match. Svitana then closed the tournament out by taking a win via a 12-2 technical fall to finish in second place. 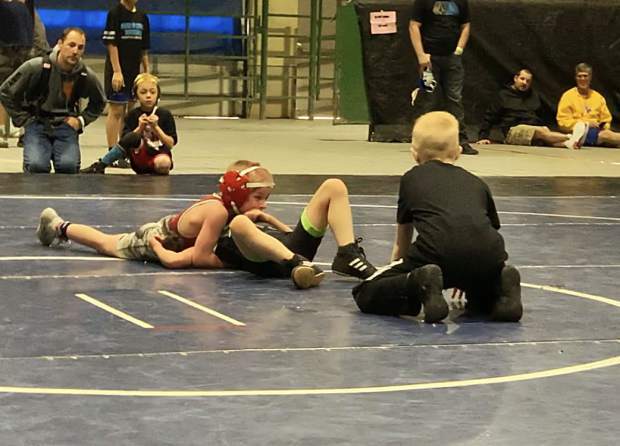 Truckee’s Quinn Dorst also wrestled in all three disciplines at the meet, competing in the 8U 56-pound division. After a tough start to the meet in folkstyle, Dorst bounced back with a pair of third-place finishes in freestyle and Greco-Roman. 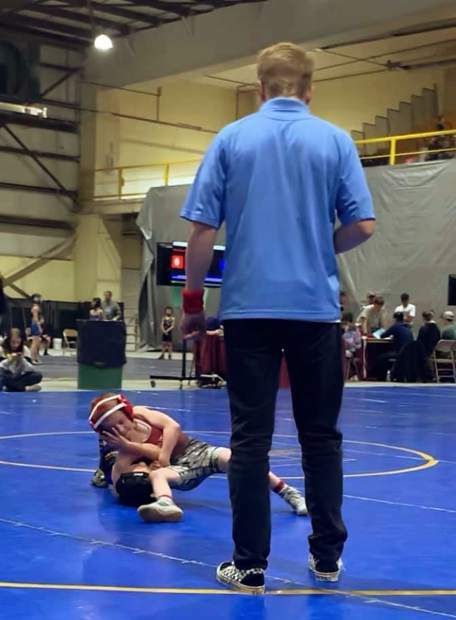 Dorst lost his first match in the freestyle tournament, but then went on a tear through the loser’s bracket, beating each of his three opponents by 10-0 technical falls. Dorst later lost his second-place match to finish in third. 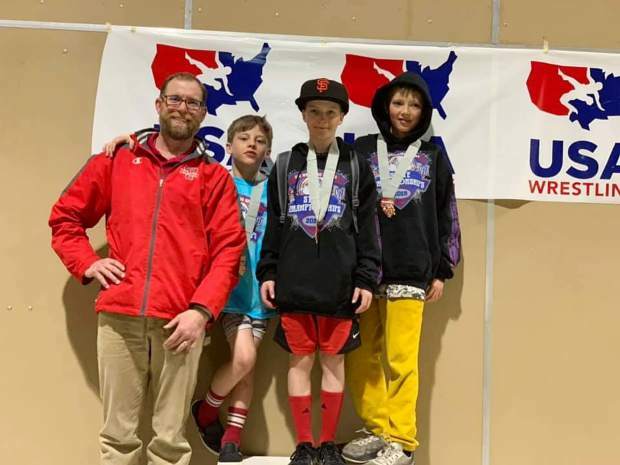 The Truckee youngster finished the weekend with a pair of wins by technical fall during the Greco-Roman tournament to claim third place. 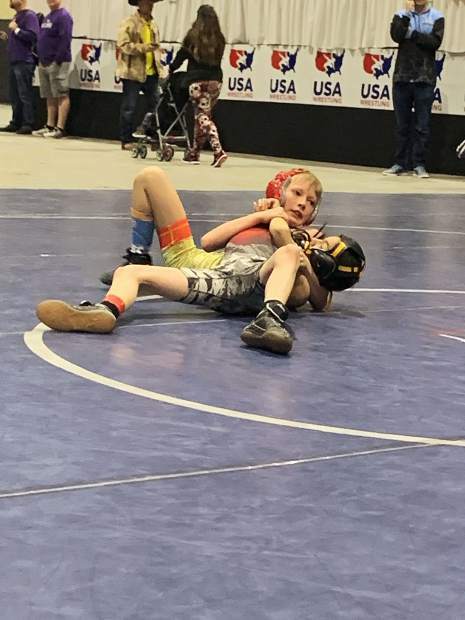 Also in Greco-Roman, Truckee’s Joseph Svitana landed on the podium out of the 12U 63-pound weight class, finishing in third place. Svitana pinned one opponent and came from behind to defeat another via a 14-12 decision. Svitana also claimed fourth in freestyle, and sixth in folkstyle during the state championship meet. Jacob Svitana was the final Truckee wrestler to compete in all three disciplines. Svitana finished in third place in Greco-Roman, competing out of the U6 34- to 37-pound division. He also captured fourth in freestyle and sixth in folkstyle. 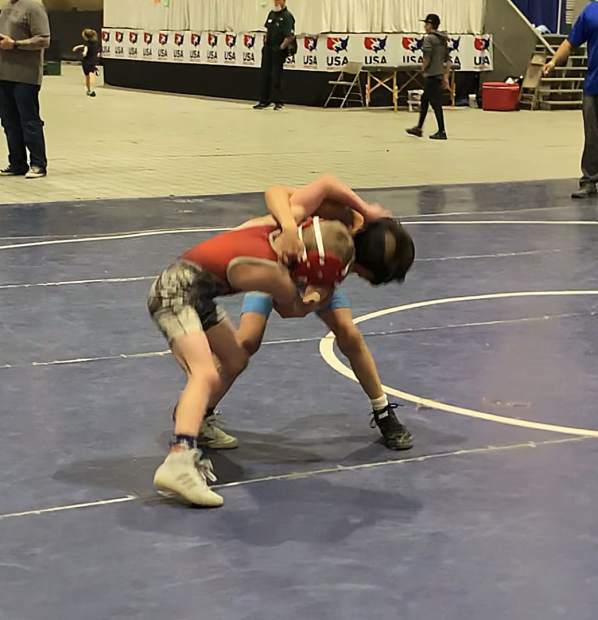 Truckee’s Lucas Scapini competed in the middle school boys’ folkstyle tournament’s 71-pound division and finished in sixth place. Hank McDaniel competed in folkstyle for the team as well, and picked up a key win to finish in sixth place.